Seascape is a 3 bedroom, 2 bathroom Opito Bay holiday home just a 1 minute walk to the beach! With a spa pool, free WiFi and stunning ocean views, this 2 storey holiday home has ample room for 2 families to holiday together. 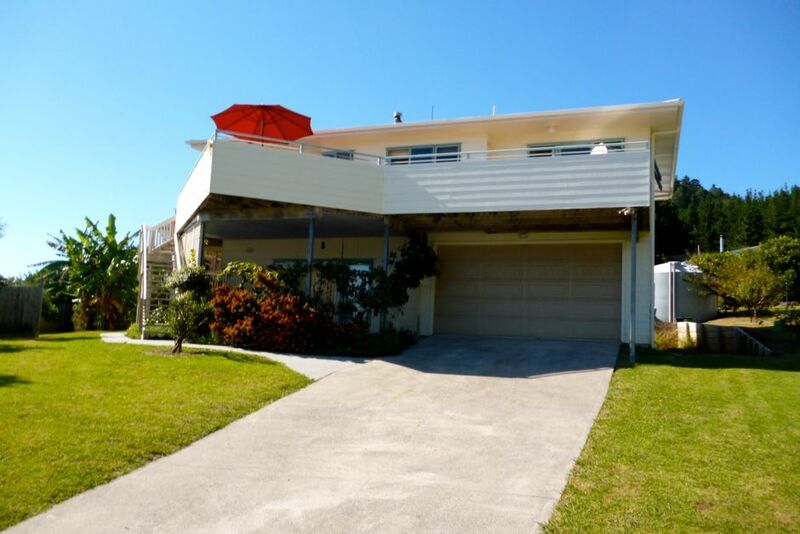 This Opito Bay holiday home is comfortable and spacious, with open plan living upstairs. The lounge and dining areas flow onto decking, where you can enjoy a laid back BBQ and gaze at the views! A central hallway leads to the 2 upstairs bedrooms at this Opito Bay accommodation. Bedroom 1 is fitted with a queen bed plus deck access, and bedroom 2 is fitted with a queen bed, king single bed and rollaway. A bathroom completes the upstairs layout. Downstairs, bedroom 3 is fitted with a queen bed, and there is a queen bed in the downstairs living area when required. The second living area downstairs offers extra space for your group including a lounge, washing machine, freezer and a bathroom. The downstairs living opens out to the sunny porch and gardens with a view to the sea, plus there is a sheltered courtyard where you can relax in the spa! Everything you require for a laid back beach break awaits at Opito... Relax and enjoy the Seascape! We loved our stay, the house is spacious and comfortable with all the facilities we could have asked for. We would definitely stay again. Thank you for your great review and for looking after our home so well. Opito is a magical spot and we are delighted to share it with you. Great location, beautiful spacious house with everything you need, and lovely hosts! Thank you so much, your house is beautiful and it had everything we needed. We really enjoyed our stay. We will definitely come back again!!! Great to hear you had a wonderful time. A beach that is hard to beat, you are welcome to come back. Plenty of room everything we needed for a great break away. This is the 3rd time we have stayed at this bach and will be booking again for next year. Kids had an awesome time in spa and using the kayaks . Thanks for letting us use your bach each year . Thanks Glennys you are always welcome and treating our place like your own which is very much appreciated. We were visiting the area for a wedding and this place was perfect. Great views, so close to the beach, kitted out with everything you need. Loved it, and would visit again! Seacape is a well appointed house with everything you require for a comfortable and relaxing stay. The kitchen has all the mod cons including a dishwasher and thermowave oven and contains everything you need. The beds are comfortable and the lounge and dinning room areas are roomy with lots of space to move around. The spa pool had lots of use and it is only a minute or so to walk to the fabulous Opito Bay beach. The outside deck has a panoramic view of the Opito By area and beyond. An excellent dining table with plenty of chairs. The bbq was easy to use and clean up. Thank you for letting us use your lovely house, we all had a wonderful time and will return for another holiday I am sure. Thank you we are delighted you had a great time and really appreciate you being awesome guests. We hope to see you again. Absolutely enjoyed our stay (We have already booked again next summer! Absolutely enjoyed our stay (We have already booked again next summer!) with family & friends at this awesome beach house, plenty room, great facilities, tidy well kept house with awesome views of the bay from the top deck & handy to the beach for swimming and launching our boat! Thanks for allowing us to stay at your beach house, we look forward to our next stay.